The most universal and basic of all fears, across all cultures, is the fear of falling. Behavioral research has established that babies are born with only two natural fears. One is a fear of certain noises and the other is the fear of falling. Over time people develop other fears. Many can become critical problems that disable normal functioning. On the other hand, most people can also overcome their fears and learn to cope with them. Learning to deal with the fear of falling can establish an important sense of confidence that often will translate into the ability to deal with other fears. The earliest and most primal fear we experience is falling, but most people have many opportunities to fall and realize at a young age that they can survive. Recreation and sports activities can accelerate that level of acceptance. Activities as diverse as gymnastics, football, hiking, and skateboarding provide plenty of opportunities. No activity deals with the fear of falling so directly and positively as judo and many jujutsu systems. 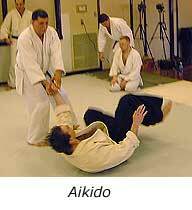 Aikido is similar but places equal emphasis on rolling as well as initiating falls in response to a number of joint manipulation techniques. Karate, taekwondo, kung fu and other like systems also have many tripping, sweeping, take down and throwing techniques. Some forms of classical Japanese sword and weapon arts also incorporate foot sweeps as part of their curriculum. Richard Carlson, author of "Don't Sweat the Small Stuff," defines fear with the acronym False Evidence Appearing Real. In general, fear is an unrealistic expectation of a negative, usually painful, outcome. It is often self-perpetuating and difficult to change. When we fear something we often try to avoid it. Yet we all know that the way to overcome fear is to face it, recognize its damaging effects, and begin a step-by-step process of dealing with it. In classes around the world this is typically the first thing judo, aikido and many jujutsu teachers focus on with new students. Before people can be expected to participate in any sports activity involving physical contact or falling, they should develop certain skills and learn to overcome their fears so they can feel comfortable falling. Yet judo, aikido and many jujutsu systems are unique among sports and martial arts in the way it incorporates a scientific approach to the methods of falling called ukemi. Unfortunately most karate and taekwondo, and kung fu, neglect proper training in falling or rolling. This is probably due to the fact that throwing, sweeping, tripping or takedowns are considered secondary techniques. But it is so important to success in any system that incorporates these techniques that students practice ukemi (falling techniques) not just when they are beginning to learn, but as a part of almost every practice session. This is obvious in judo, aikido and jujutsu but also important in other arts to avoid potential injury. "As I have often said if one hates to be thrown, one cannot expect to become a master of the art. By taking throws time after time, one must learn how to take falls and overcome the fear of being thrown. Then one will become unafraid of being attacked and be able to take the initiative in attack. Only by following this manner of training can one learn true Judo technique." It is not possible to excel in throwing, or to defend against an attack successfully, without a thorough understanding of falling. It is also not possible to be successful in matwork (ground fighting) without learning to control the transition from standing to the mat, the very definition of falling. 1. At first practice falling or rolling from a low position, and gradually move higher. 2. Learn one direction and style of falling, then learn to fall or roll in other directions. 3. First fall or roll in place, then add movement. 4. In the beginning move slowly and carefully, then increase speed. 5. First fall by yourself, then have a partner throw you. 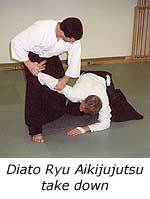 In aikido learn self-sacrifice throws only after mastering the basics of falling and rolling. Here it is often helpful to have a partner assist you. 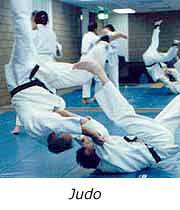 In Judo or jujutsu when someone is throwing you, repeat the learning steps 1 through 4 (i.e. start with a low throw, one direction, no movement, and slow speed). This step-by-step approach to safe falling, rolling or self-sacrifice throws sets the stage for developing confidence, coordination, and control. Learning to fall properly and safely can be a big step towards facing some of the other more difficult lessons that come with intense training. In addition, this method of learning will immediately transfer well to the study of your first throws, sweeps or takedowns. For example, in judo first learn easy throws, in one direction, without movement, slowly with a cooperating partner. As you master each element then add other directions, movement, resistance, etc. Knowing the importance of ukemi, strive to improve your skills. Challenge yourself by practicing different ways to fall, keeping safety uppermost in mind. Constantly work on developing a fearless attitude that will eventually allow you to relax and fully enjoy the complete Judo experience. Ohlenkamp is a martial arts writer and founder of www.judoinfo.com. He is a certified United States Judo Association instructor, referee, master rank examiner, and master coach (the highest level of certification), and he was awarded United States Judo Coach of the Year for 1999. He holds a sixth degree black belt in Judo and a sixth degree black belt in jujitsu and has over 31 years of training and experience in various martial arts as a competitor, instructor, team coach, and tournament official.